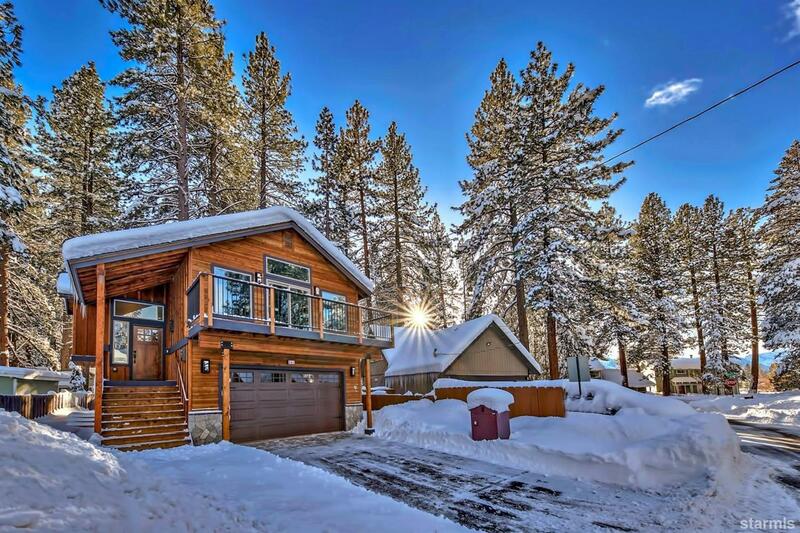 Brand new custom home within walking distance to the lake, Cove East Beach, and just steps from the Tahoe Keys! Upgrades and attention to detail are evident throughout this skillfully crafted home. The upstairs great room has beautiful filtered meadow and mountain views and leads to a spacious deck which is perfect for entertaining. The great room has tall vaulted ceilings, 7.1 surround sound, a custom stone facade fireplace with a reclaimed timber mantle, and beautiful reclaimed wood accent walls. The gourmet kitchen has rich stained knotty alder cabinetry, granite slab counters, upgraded stainless steel appliances, and a gas stove. Downstairs is a large family/game room with surround sound, a wet bar with custom timber shelves, and accent lighting. Each well designed bathroom has gorgeous custom stone and tile and rustic mountain fixtures. The entire house is heated with hydronic in-floor heat and all living areas are finished with brushed wide plank white oak hardwood flooring.